Two weeks from the time I’m writing these words I’ll be running the 2011 Boston Marathon. 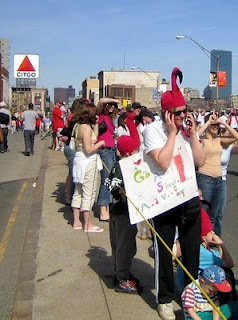 Guessing at my pace, I’ll be somewhere around mile 10 I hope, cruising through Natick among the throngs, keeping my ears open for the Scream Tunnel. Two weeks ago I ran the longest of the long runs, 21 miles from the start line to Boston College just past Heartbreak Hill. This past Saturday I wanted to run the remaining part of the course, most of which I’d never run. I started at CRI on a steadily warming morning and headed up the hill to BC. At the junction with the marathon course I saw other runners who were part of the training runs set up by running clubs and volunteer groups, but I was solo that day. Not to worry, as the weather was great and I had enough water and fuel. I followed the course up to the Reservoir and then turned onto Beacon Street which I’d never run before. The scene is very familiar since I’d driven it many times but it’s quite a bit different on the sidewalk. Groups of runners headed out passed by, each of them going over their race prep in their heads, or at least that’s what I imagined them doing. I saw lots of landmarks that I knew in other contexts but they were comforting to see. As I approached Coolidge Corner I remembered watching the marathon there may years ago. I looked up casually and spotted the Citgo Sign, an important sighting for any marathoner. I’d never quite seen it like that before. Onward, inbound, with the Mass Pike in sight and then past, and the turn on Comm Ave. I know this area very well from Red Sox games but it looks different without thousands of baseball fans on game day. 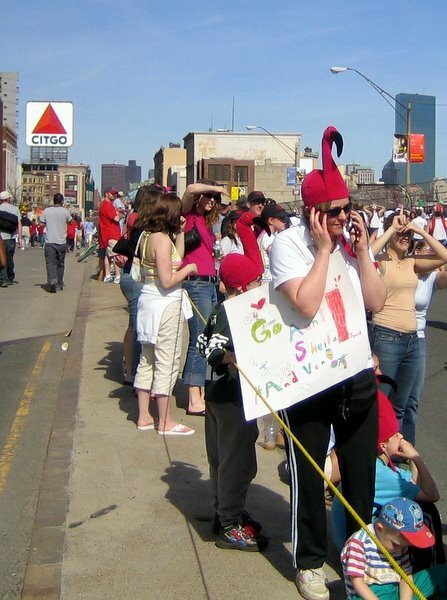 Seeing it on Marathon Monday should add more layers to my image of the area. For some reason I thought it was much further from here to the end of the course, but it’s really only a mile or so. I started looking at street signs and all of a sudden there was Hereford! But I didn’t turn right, I am saving that for the race. Instead I went a few blocks further and turned there, looping back on Boylston past the finish line, past Hereford again, and looped back onto the course the opposite direction. The rest of the run was anti-climactic after completing the trek to the finish line, but I enjoyed running the opposite direction on Beacon. I took off my wind shell and rolled up my sleeves in the warm spring sun as I climbed back to BC, then dropped down to the river. I even had enough in the tank for some speed work for a mile or two, which felt good. At the boathouse I did one lap to make sure I hit 13.1 miles – 2:07, not bad for my last training run. Now I get to taper for real. A few easy runs each week, my last one scheduled for next Wednesday. At this point I almost want to get it over with but I'll work to enjoy every minute between now and the race. I'm looking forward to not having a long run each weekend and catching up on my spring skiing. But I know I'll miss it, hopefully by Fall. At the marathon Expo I'll be keeping my eye out for a nice fall marathon to sign up for.